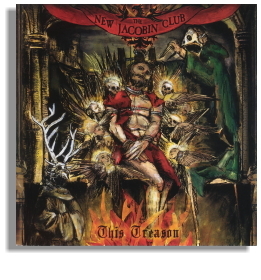 Get Your Digital Copy of The New Jacobin Club’s 2010 Full-Length Album, THIS TREASON, For Just $8.00! Click Here To Download “This Treason” Now! The New Jacobin Club had its beginnings in the cold of Western Canada just as the 20th century was giving it’s last gasp. This Bohemian horror punk ensemble is a true marriage of music, performance art, live visuals and storytelling. On the 10 songs making up THIS TREASON, a medieval tale of corruption and the occult is told by a cast of wicked characters including peasants, noblemen, priests, killers and supernatural beings. All this drama is delivered with roaring anthematic vocals accompanied by shimmering orchestral arrangements, spooky steampunk theremin and elegant electric cello! You will receive your digital copy of “This Treason” via email, immediately after placing your order.